On Saturday, the country's semi-official FARS news agency reported that Iran freed four U.S. prisoners, including Washington Post journalist Jason Rezaian, as part of a prisoner swap. Although it has been reported by various Iranian media, there has been no official U.S. confirmation of the prisoners' release. The news comes on the heels of the expected lift on sanctions against Iran as it scales back its nuclear program. “Based on the recent decisions made by the national security council and also based on our ruling system’s national interests, four imprisoned dual nationals were released today," senior judiciary official Abbas Jafari Dowlatabadi reportedly said. The Associated Press reported that along with Rezaian, former Marine Amir Hekmati, pastor Saeed Abedini, and a fourth unnamed American were the other released prisoners. The Washington Post reports that all four of the reportedly freed prisoners have dual U.S.-Iranian citizenship. Hekmati, the longest held prisoner of the four, has been imprisoned since August 2011. Rezaian, who has been held in Iran for over a year, was held on unspecified charges for seven months after he was seized in July 2014. In May 2015, Rezaian was charged with espionage, gathering confidential information, and spreading propaganda. 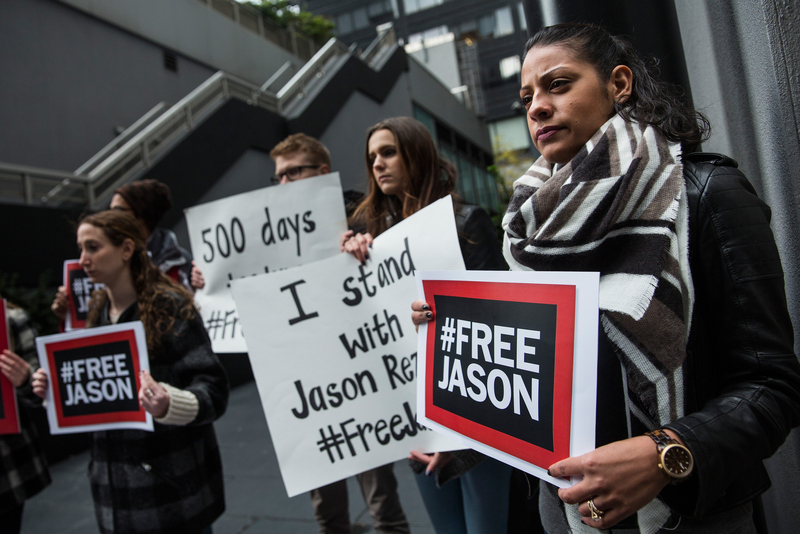 In a largely behind-closed-doors trial, Rezaian was convicted for unspecified charges in October and sentenced to a prison term, the length also unspecified, in November. Rezaian was taken from his home in Tehran in July 2014, along with fellow journalist and wife, Yeganeh Salehi. Salehi was freed on bail in October 2014. She made contact with her husband while he was still imprisoned, and reported that he seemed healthy, though there were concerns about his high blood pressure, which he needs daily medication to treat. According to the Washington Post, recent petitions for his release have cited his "declining health," including continued weight loss and complications from problems with his blood pressure. This news comes just as world leaders met in Vienna likely to end the international sanctions placed against Iran because of its nuclear program. This is one of the major steps to implement the hotly debated Iran nuclear deal that was reached this past summer. The Vienna-based International Atomic Energy Agency must certify that Iran has fulfilled requirements detailed in the deal, which was agreed on by six world powers including the United States in July. The Washington Post reports that Iranian Foreign Minister Mohammad Javad Zarif seemed optimistic when he met with U.S. Secretary of State John Kerry on Saturday. The implementation of this deal will free up over $50 billion in frozen assets for the country.